In the original paper All Possible Symmetries of the S-Matrix, by S. Coleman and J. Mandula, they prove their famous 'no go' theorem regarding the possible extensions of Poincaré symmetry. The loophole that allows for supersymmetry is their assumption that the generators are bosonic, as it is often said in modern introductory courses to SUSY. But I have not been able to pinpoint this precise statement in their original paper. Could the fifth requirement be that assumption, that the generators are bosonic? 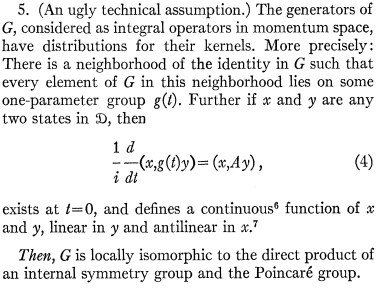 If so, I do not see why demanding that the generators be integral operators is equivalent to demanding they be bosonic, as opposed to fermionic generators with spinor indices which satisfy anti-commutation relations. Perhaps the statement, often quoted in lectures, that the assumption is that they are 'bosonic,' is a gross simplification, or inaccuracy? A symmetry transformation is said to be an internal symmetry transformation if it commutes with P. This implies that it acts only on particle-type indices, and has no matrix elements between particles of different four-momentum or different spin. A group composed of such transformations is called an internal symmetry group. By demanding that commutators vanish, they exclude SUSY, since not all the supercharges commute with all Poincare generators. See for example equation (2.53) in . A very nice discussion regarding the Coleman Mandula theorem can also be found in . Not the answer you're looking for? Browse other questions tagged quantum-field-theory supersymmetry group-theory locality grassmann-numbers or ask your own question. Can someone give a simple expose on Coleman Mandula theorem and what Mandelstam variables are? Why are relativistic quantum field theories so much more restrictive than non-relativistic ones? Weinberg's Coleman-Mandula theorem proof sufficient condition for isomorphism?